Back in May A.Danesh asked "How can I see related tag for a search query?". I didn't actually see this question at the time but by September I started wondering the same thing. 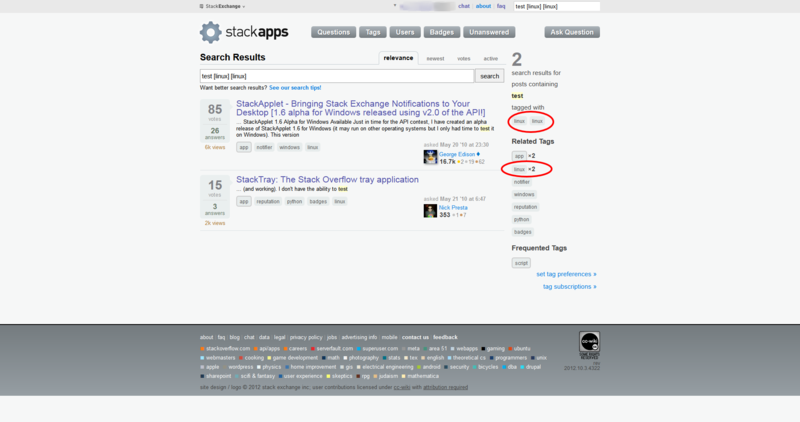 In fact I went so far as to post a feature request asking for it: Show “Related Tags” on the “Search Results” page. But then I decided not to be lazy and went ahead and implemented it myself. You've probably noticed that when you're on the page for any tag (or set of tags), you will see a list of Related Tags in the sidebar on the right. You may have noticed the Search page does not have this feature, yet conceptually it's possible to imagine that there are tags related to search results. This user script counts all the tags in the search results on the page on the screen and does its best to emulate the Related Tags module as seen in tag pages. If you click on one of the related tag links, that tag will even be added to the search. I hereby release this script into the public domain. Do what you want with it. If you are using Firefox with Greasemonkey installed and enabled, you can install it directly by clicking here. It's a browser user script so it can be used directly on Google Chrome and opera via their "extensions" menus and pages. On Firefox it requires Greasemonkey. You can contact me, Andrew Dunbar, a.k.a. hippietrail via the Travel Stack Exchange chat room, "You Are Here", or just leave a comment or answer right here in StackApps. Make a clone of the code on github. Instead of linking to a .tar.gz archive, don't you think it's more practical to link to the raw file instead so it can be installed immediately? It seems more logical to me. Also, there is a small problem that you can add tags to your search query multiple times. If a tag is already in the search query, it should not be displayed in the "related tags" list IMO. Not the answer you're looking for? Browse other questions tagged script search related .